Apparently, turning three also means that you must become as stubborn as humanly possible. Simple requests like “please finish your vegetables” or “Come here, please, so I can put on your shoes” or “Come here and rub Daddy’s feet” are more often than not met with a firm “NO!” followed by screams and tears if we don’t, for some insane reason, accept your “NO!” as the final word. This stubbornness would be something to marvel at if it didn’t make me want to beat my head in with the nearest blunt object every time you dig your heels in when you don’t want to do something. And while your stubbornness is awe inspiring, it’s also cloaked in irony. Irony? You ask. So, what I’m trying to tell you, my stubborn little ones, is that you… don’t… have… a… chance. We will out-stubborn your stubbornness. And I know that annoys you to all ends but you’re just going to have to deal with it because I am not about to be played by a couple of toddlers who still can’t wipe their own butts. So, bring it on, my little ones. Your mother and I are ready. When I was a kid, I had my own record player, which for you kids out there, was a rectangular box with a round spinning “turn table,” on top of which you placed a vinyl disc and, in turn, placed an arm with a needle that is attached to the record player onto the vinyl which would then transmit sounds produced from the grooves in the vinyl through a set of speakers. Very high tech. Anyway, my record player was “portable” in that it had a little suitcase exterior with a handle to take it anywhere me and my eight year old friends wanted to party. I don’t remember many albums that I had to play on that thing but I do remember having a Sesame Street album that got a lot of play for a while. Which of these Sesame Street albums I had was beyond my recollection but I think it must have been one made between 1971 and 1978. Maybe Grandmother knows. Somewhere along the way, Bert and Ernie and their “friendship,” lost their appeal and I moved on to other musical interests that included brief infatuations with Country (John Denver!? ), Hard Metal (AC/DC! ), an ill-conceived gangster rap time period (2 Live Crew?! ), and an entire decade of musical confusion (hello 1980′s). I have settled into my late 30′s and have come to accept my musical tastes for what they are. That is, mostly mainstream. The musical snobs would deride my musical tastes the same way they do American Idol, but I’m too old to care. I am what I am. In days gone by, I’ve seen concerts that range from Phil Collins to Dave Matthews but it’s been a while since I’ve last seen a live musical act. But yesterday, there was a hot ticket in town. I had planned ahead and bought tickets for the entire family months ago when the concert was first announced and I was excited as we headed town to the Sports Arena in anticipation of a large crowd. Soon enough we had made our ways indoors, negotiated the throngs of other rabid fans – some dressed in costume. Overall, it was a young crowd but there were some thirty-somethings there too and we exchanged knowing looks and smiles as we passed each other in the crowded halls leading to our seats. How to get to Sesame Street?! That’s right, my friends, yesterday Swee’Pea, TheMonk, Mommy and Daddy all rocked Sesame Street Live. Big Bird, Elmo, Oscar the Grouch, Grover, and “best friends” Bert and Ernie along with a lot of their friends all danced, sang and generally rocked the toddler set. Three year olds all over the arena got down and danced and sang. Kids every where were boogieing in their seats or rushing the stage. A small mosh pit of toddlers even formed at the base of the stage only to be guided away by arena security. A good time was had by all. It makes me want to dig out that vinyl record from decades ago but there’s just one problem. Anyone have a record player? Every now and then, when she doesn’t know I’m looking, I like to watch my wife do every day things. Watching her read or watch TV or listen to another person speak make me feel like I really know her. Each expression, each nod of her head, each smile on her lips is perfectly ingrained in my mind. The way she tilts her head slightly when she laughs, the way she uses her hands when speaking or the way her hair falls across her forehead are all so familiar and comforting that I can’t help but smile when recalling them now. She’s so much different than I am, you know. She thinks out everything before she acts. I act impulsively. She’s a bit shy. I’m sooo not shy. She’s absolutely beautiful. Me? Not so much. She’s the Yin to my Yang and while a lot of the time we are just trying to get through the day, week or even month, today I get to step back and reflect. That’s what anniversaries are for. Yes, Andrea and I stood before each other eight years ago today and promised to be with each other ’til death do us part. We promised to build a life together. Material things, for sure, such as a house, a car or two (right honey?!) and a big comfy bed. But even more, we promised to build a life that included a family. A family that loves each other. A family that laughs together. A family that is there for each other, no matter what. And the great part is that we’ve kept that promise. 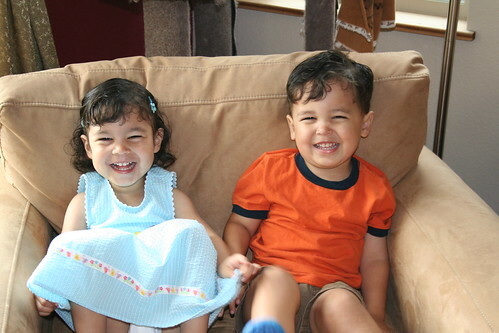 And every time I see Swee’Pea and TheMonk laugh or give hugs and kisses or comfort each other in their time of sorrow, I take great pride in knowing that we’ve created everything we wanted. We’re a good team, Andrea and I. And I love her with all of my heart. Happy Anniversary, my beautiful wife! You have survived eight years with me. You deserve a medal or something. Maybe a kiss will do. Um, yeah. Hey, how about those Padres, Swee’Pea?! I think I have documented before how much of a wimp I am when it comes to addressing some touchy issues that my kids bring up. 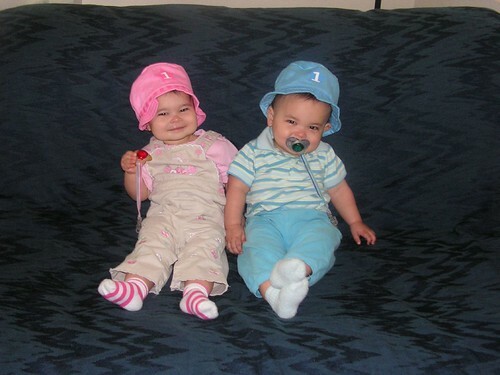 I guess I’m just not ready to imagine my little ones actually growing up. 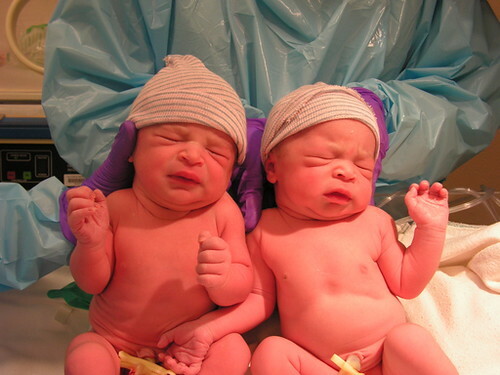 I just want to hold them and squeeze them and smooch them forever and ever. Alas, they seem to be conspiring against me. In fact, they insist on getting bigger and becoming more and more mature. Case in point. I am changing Swee’Pea into her pajamas this evening and I sit her up to put on her pajama top. She is holding her plush kitty that is her bedtime companion and she is rubbing the soft animal against her chest. Birthday Party, Go… Go… Go! A Late night baking and icing Dora & Diego cakes: Frickin’ tiring. Three years, my little ones. Today, you are three years old. I cannot believe how much you have grown in the past year. You are speaking in full sentences, have opinions on everything, and have a memory that is better than any elephant (this is good when it comes to remembering rules, not so good when remembering that there are cookies in the cookie jar). You both continue to be such a joy to be around. Your mother and I, after putting you to bed at night, often look at each other and comment how amazing you are. Each and every day is full of wonder and joy. We are truly lucky to have you. I am impressed by how well behaved you both are. You eat your vegetables, you rarely throw tantrums, and you listen when Mommy and Daddy tell you to do something (Most of the time. You’re not perfect but, then, who is?). You both love to play. You love to laugh. You love to read books. You love each other. And that is the best thing ever. So, now that you are three, you are definitely a “big boy” and a “big girl” as you both told me this morning. It is something that I’m going to have to come to terms with. I’m not sure how it happened but you are, indeed, a “big boy” and a “big girl.” You can put your sandals on all by yourself. You can climb up into your car seats. You don’t quite have the knife juggling down quite yet, but we’re working on it. So, Happy Birthday my little ones. I love you more than there are stars in the sky. 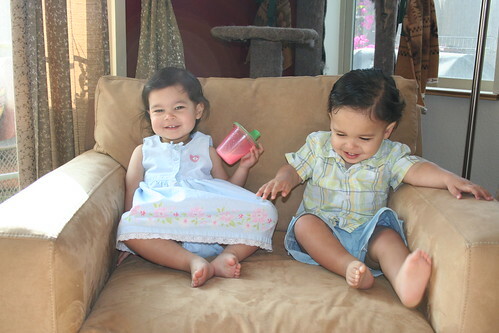 Swee’Pea and TheMonk had various illnesses today that kept them away from daycare. And seeing as how people get all judgmental when we leave them home alone, I decided to stay home with them today. But first I needed to pick up a few things at the office so I could pretend like I work at home get some work done at home. So, I packed up my two little bundles of germs and headed to the Y. Upon our arrival, Swee’Pea and TheMonk were a big hit as no one at this Y had ever met them before (I started at this Y in January). I gave Swee’Pea and TheMonk a tour and introduced them to my staff, starting with our receptionist. Our receptionist is a young lady who is a very hard worker with a great sense of humor. Which is fortunate for me because I enjoy teasing her about how she never seems to be working. The great thing is she has no qualms about giving it right back to me so we have bonded in that way. As I finished the tour and we were back up front where the reception area is, our receptionist was nowhere to be found – most likely collecting a fax off the fax machine or making copies. Swee’Pea was quick to understand the significance of this. And I swear to God, the look on her face looked like she was about to issue a counseling statement. Win some books. With real paper pages. So I got an email this week from a very nice lady this week. (I’m only saying she’s nice because she’s giving me free stuff. Really, I don’t know her and she could be absolutely evil. But I’m betting she’s more on the nice side since she’s willing to give away 11 different books to five different people). So, if you’re interested in winning these great books I have devised a contest. Here’s the thing: Leave a comment with your absolute favorite quote from a book. I’ll randomly choose the five winners on Sunday. In order to get the books, of course, I’ll have to email you to get your address so don’t leave a bogus email! 1. Living on the Black: Two Pichers, Two Teams, One Season to Remember By John Feinstein. Read an Excerpt here. 11. The Dudes’ Guide to Pregnancy By Bill Lloyd , Scott Finch. What am I going to be when I grow up, Daddy? “What am I going to be when I grow up, Daddy?” TheMonk asks me as we cuddle on the couch. “What do you want to be, Little Man?” I ask. “I dunno.” he replies with sadness in his voice. Son, we had this conversation just this morning. The first Tuesday in June when many states went to the polls to vote on important issues and, in some states, to elect a candidate for the office of the President of the United States. it is certainly a day to reflect on our future. And then, as the enormity of the day hit me and I looked into your eyes that reflect your Latino, African-American and Caucasian roots, I felt with all of my heart that you truly can be anything you want. “Do you want to be President of the United States, Monk?” I ask. And while you replied in the negative, such a thing too far out of your three-year-old world, today, more than any other day, that possibility is very, very real. This election season has been historic in many ways. A woman and an African-American man each were poised to become the nominee of the Democratic party. It’s a reflection of our little world here and it makes me so excited for you and your sister’s future. This isn’t about our political views or a party affiliation. No, this is affirmation that anything is possible. So, my son, to answer your question, you really can be anything you want to be. You can be a fireman, a race car driver and, yes, The President of the United States. In fact, if you do become President you won’t be the only one in the family who wants to be a world leader. It’s dinner time and we are dining on Boboli pizza, apple sauce and a glass of rice milk. The twins are enjoying the pizza and all is well. Everyone is in a good mood at the end of a nice weekend and I am relaxed and at ease while eating my slice of pepperoni pizza. I run over to his chair and prepare to lift him up out of the chair. His face is a deep red now and I know I have to act fast. I focus on what I’ll do once I reach him. I decide I’ll whack him between the shoulder blades first but will also be prepared to lift him up to perform the Heimlich maneuver if needed. And then… The kid smiles at me. He pulls his hands away from his neck, relaxes as the redness drains from his face, and lets out a laugh. I stop in my tracks, having trouble computing just what is happening. It is clear that he is no longer choking but what becomes even clearer as he continues to laugh is that he never was choking in the first place. Yep, the kid thought it would be funny to make his old man sweat. And his laughter made it clear that he had succeeded pretty good. Until I started choking him with my own hands. Then it wasn’t so funny.